After the stuning defeat of the Luftwaffe during the Battle of Britain, Germany turns it mighty war machine towards Russia with hopes of defeating the great empire. Much to Hitler's dismay, his troops are held at bay by both an unforgiving winter and the stubborn battle-hardened Red Army. The tides of war begin to turn against the Reich and Germany must suddenly scramble to maintain the strong industrial complex that has helped it reign supreme. Thus beginning in 1943, Allied air forces conduct one of the most agressive, relentless, and bloody air campaigns in the history of warfare...and you are there. Experience the greatest air war in history! 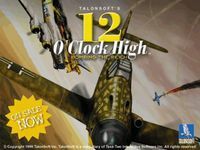 Recreated by Gary Grigsby and Keith Brors, legendary designers of Talonsoft's critically acclaimed "Battle of Britain" and SSI's Steel Panthers, Talonsoft's 12 O'Clock High: Bombing the Reich puts you in the commander's chair.